Scotland's first minister has branded speculation about the impact of the general election on her plans for an independence referendum as "nonsense". In a series of tweets, Nicola Sturgeon said she would set out the way forward "in due course after talking to people across the SNP". And she insisted she would take decisions in the best interests of Scotland, and not just her party. She later faced calls at Holyrood later to abandon her plans for a referendum. Opposition MSPs used a debate on the economy to argue that the continuing prospect of another referendum independence would cause damaging uncertainty for businesses - but their motions calling for it to be shelved were defeated in a vote. Scottish government ministers, who did not discuss an independence referendum in their first cabinet meeting since the election, argued that the main threat to the economy is Brexit. Ms Sturgeon attended a meeting on SNP MSPs in the Scottish Parliament ahead of the debate on Wednesday afternoon. She has written a letter to the prime minister in which she argues that new Brexit proposals are "urgently needed" to end the "confusion surrounding the UK's position" with less than a week to go until talks with the EU are due to begin. She repeats her calls for Scotland and the UK to remain in both the single market and the customs union, for the UK's devolved administrations to be involved in the Brexit negotiating team, and for the rights of EU citizens living in the UK to be guaranteed. She says that the Scottish government's Scotland's Place in Europe document, which was published in December, provides a blueprint for the way forward for the whole of the UK. 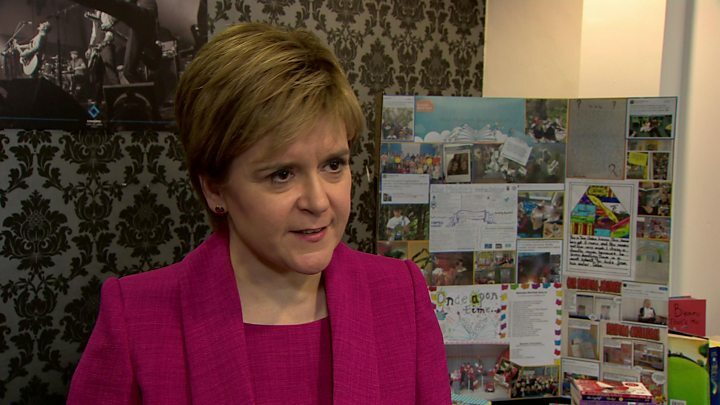 Ms Sturgeon has previously said she will "reflect carefully" on her plans for an independence referendum after the SNP lost 21 seats in the general election, but has conceded that her call for a second vote on leaving the UK was a factor in the result. In March, she called for a referendum to be held either towards the end of next year or the spring of the following year, "when the terms of Brexit are known", but it was rejected by the UK government. But there have been reports since the election that Ms Sturgeon was planning to "rebrand" the independence referendum as a vote on the finalised UK Brexit deal. SNP MEP Alyn Smith told the BBC's Good Morning Scotland programme on Wednesday morning that any future referendum "would be on the terms of Brexit set against independence". A short time later, the first minister tweeted that much of the media speculation about the implications of the election result for her referendum plans was "nonsense". She added: "I'll set out way forward in due course after talking to people across @theSNP. "I'll take decisions in best interests, not just of @theSNP, but of Scotland...and not be dictated to by demands for quick headlines!" She went on to say that her government would focus on trying to influence Brexit talks - and repeated her claim that a "Tory led hard Brexit is simply not acceptable" in the wake of the election result. Ms Sturgeon later told BBC Scotland that she would not be "rushed into knee-jerk decisions" on a referendum, and that the immediate focus should be on the forthcoming Brexit negotiations. Will the SNP abandon independence? No. Will they abandon a referendum as the conduit through which independence is achieved? Absolutely not. So what are they doing? Well, they may need to change the nature of the language. I think they feel that they didn't get across sufficiently the point that the referendum they want on independence is at the end of the Brexit process. They kept saying: "When the prime minister says there shouldn't be a referendum now, we agree". So I think they will try and re-emphasise that. That will not be sufficient for their pro-Union opponents, who will say they don't care how it is rebranded or that it is being placed in contradistinction to Brexit - it is not wanted and it is not needed. Scottish Conservative leader Ruth Davidson, who saw the number of Scottish Tory MPs rise from one to 13, has claimed that the SNP's losses in the election meant that "Indyref2 is dead". Her party has accused Ms Sturgeon of having "given up representing Scotland and is now focused solely on her discredited and unwanted plan to drag us back to a second referendum" and of "turning a tin ear to everyone outside the SNP who just want a break from her political games". And Labour said that Scotland "won't be fooled by Nicola Sturgeon's desperate plan to rebrand her divisive referendum". In what was first formal chance for MSPs to debate the general election result, the Tories, Labour and Liberal Democrats called on the SNP to shelve plans for another referendum. The Holyrood debate on "opportunities for growth" followed publication of the State of the Economy report by the Scottish government's chief economist. The report confirmed growth overall in Scotland during 2016 of 0.4%, which was "below trend and expectation". The oil and gas sector downturn continued to affect the economy last year, though there are emerging signs of confidence returning to the industry, the report found. Image caption Ruth Davidson has insisted that plans for a second independence referendum were now "dead"
Meanwhile, Scotland's labour market has "remained resilient", with unemployment below the UK figure and falling over the past year. The report states: "Brexit continues to present a significant risk to business and consumer sentiment in Scotland with investment sensitive to changing market signals. "It also presents the greatest source of uncertainty for the outlook particularly beyond 2018. The range of independent forecasts for 2017 suggest growth of between 0.9% and 1.3% for Scotland." Economy Secretary Keith Brown said there was no doubt that the dip in oil and gas prices in recent years has had "a continuing effect on the Scottish economy". The minister said uncertainty around Brexit was the main concern for business leaders, while the "very rapid" depreciation in the price of oil and gas has had a major effect. But Mr Brown said there were signs of returning confidence and development activity in the North Sea, and pointed out that Scotland now has a lower unemployment rate than the UK as a whole. He told the Good Morning Scotland programme: "What we are now seeing with Brexit is the push up in inflation, the impact that is having on people's lives in terms of wages. "So that's the challenge we have now - but we have kept many people in employment throughout the recession and subsequent Brexit uncertainty."